Egbert Barten of the Geoffrey Donaldson Institute lent me some cigarette cards he recently acquired, to share with you. Earlier we did some posts on cigarette cards by Ross Verlag in Berlin, but these very small cards (ca. 6.5 x 3.5 cm or 2.6 x 1.2 inches) were all produced in the 1930s by various tobacco firms in Great Britain to be included in cigarette packs. 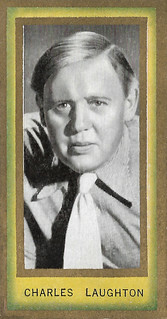 Charles Laughton. British cigarette card in the Film Favourites series by Carreras LTD, Arcadia Works, London, no. 28. Photo: Mayflower Pictures. Collection: Geoffrey Donaldson Institute. Leslie Howard. British cigarette card in the Second Film Stars series by John Player & Sons, no. 26. Photo: Radio. Collection: Geoffrey Donaldson Institute. Ray Milland. 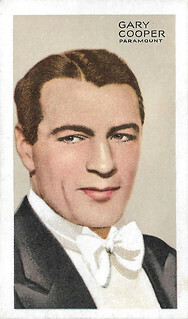 British cigarette card in the Third Film Stars series by John Player & Sons, no. 30. Photo: Paramount. Collection: Geoffrey Donaldson Institute. Paul Muni. 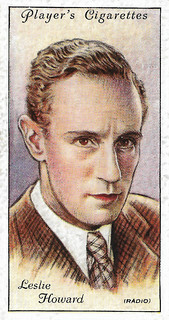 British cigarette card in the Third Film Stars series by John Player & Sons, no. 32. Photo: Warner - First National. Collection: Geoffrey Donaldson Institute. Sonja Henie. 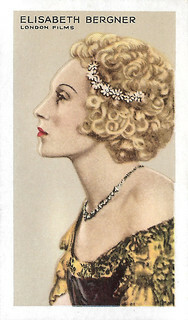 British cigarette card in the Film & Stage Beauties series by Carreras LTD, Arcadia Works, London, no. 16. Photo: 20th Century Fox. Collection: Geoffrey Donaldson Institute. Jean Darling. British cigarette card in the Film & Stage Beauties series by Carreras LTD, Arcadia Works, London, no. 34. Photo: Murray Korman. Collection: Geoffrey Donaldson Institute. Jean Darling (1922-2015) was an American child actress who was a regular in the Our Gang short subjects series from 1927-1929. As an adult, she performed on Broadway. The Film & Stage Beauties series above was a series of 54 real photographs issued with Carreras cigarettes. A Carreras slip-in album was obtainable from all tobacconists. The price was One Penny, and the albums for the other series had the same price. The Stars of Screen & Stage series below consisted of 48 cards. Wheeler & Woolsey. 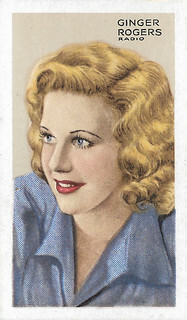 British cigarette card in the Stars of Screen & Stage series by Park Drive Cigarettes, Gallaher Ltd., London & Belfast, no. 6. Photo: Radio. Collection: Geoffrey Donaldson Institute. Ginger Rogers. 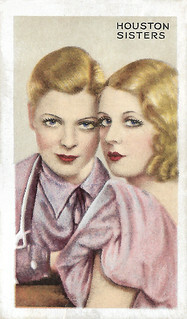 British cigarette card in the Stars of Screen & Stage series by Park Drive Cigarettes, Gallaher Ltd., London & Belfast, no. 14. Photo: Radio. Collection: Geoffrey Donaldson Institute. Elisabeth Bergner. 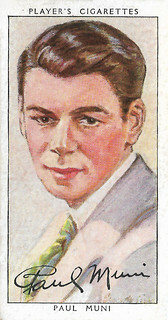 British cigarette card in the Stars of Screen & Stage series by Park Drive Cigarettes, Gallaher Ltd., London & Belfast, no. 17. Photo: London Films. Publicity still for The Rise of Catherine the Great (Paul Czinner, 1934). Collection: Geoffrey Donaldson Institute. Gary Cooper. 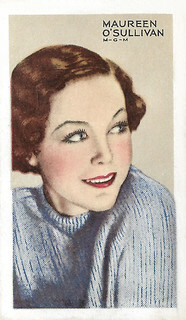 British cigarette card in the Stars of Screen & Stage series by Park Drive Cigarettes, Gallaher Ltd., London & Belfast, no. 24. Photo: Paramount. Collection: Geoffrey Donaldson Institute. Maureen O'Sullivan. 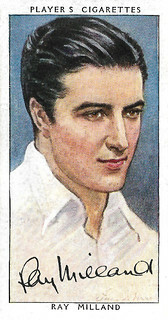 British cigarette card in the Stars of Screen & Stage series by Park Drive Cigarettes, Gallaher Ltd., London & Belfast, no. 25. Photo: M.G.M. Collection: Geoffrey Donaldson Institute. The Houston Sisters. 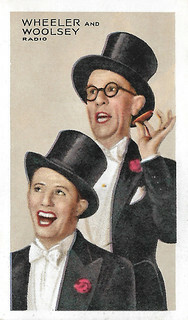 British cigarette card in the Stars of Screen & Stage series by Park Drive Cigarettes, Gallaher Ltd., London & Belfast, no. 43. Photo: M.G.M. Collection: Geoffrey Donaldson Institute. Scottish sisters Renee Houston (1902-1980) and Billie Houston (1906-1972) were the daughters of a liquor salesman, James Gribbon, who, with his wife, Elizabeth Houston, later formed a variety song-and-dance act. The sisters formed their own music hall double act as the 'Houston Sisters', also known as 'The Irresistibles'. Their comedy was based on sibling rivalry and Scottish working-class life and in 1926 they appeared before the Kind and Queen at the Royal Command Performance. After World War II, Renee appeared in middle-aged roles in many British films as tough mothers and assorted harridans. She also appeared as comic support in several instalments of the Carry On series. Sources: IMDb and cigarette cards.